Democratic Gov. Dannel P. Malloy said Thursday that Connecticut wants to be known as a state that welcomes and embraces the LGBT community. 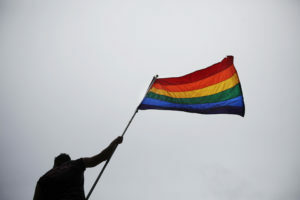 The department plans to work with gay and lesbian organizations, such as the Connecticut Gay and Lesbian Chamber of Commerce and LGBT community centers, to encourage people to apply to become parents. DCF Commissioner Joette Katz said there are roughly 100 LGBT adoptive families currently in the state’s system. She said she wants to increase that number to at least 250 by January, when Malloy’s term expires. The Kansas Legislature this year passed legislation that prevents barring faith-based agencies from providing adoption or foster care services for the state because the agencies won’t place children in homes that violate their “sincerely held” religious beliefs. Republican Gov. Jeff Colyer is expected to sign it into law. Derided by LGBT-rights advocates, the bill was backed by the state’s Catholic bishops and conservative groups. Meanwhile, the Oklahoma Legislature overwhelmingly approved a similar bill, granting legal protections to faith-based adoption agencies that won’t place children in LGBT homes. Other bills aimed at curtailing LGBT rights in Oklahoma were derailed.